Manager Pat Fenlon was not too downhearted after Hibernian squandered a two-goal lead at home to Inverness. Goals from Eoin Doyle and David Wotherspoon had Hibs heading for the top of the league but the Highlanders hit back to level an entertaining game. 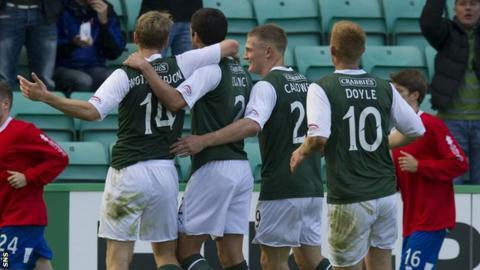 "I was pleased with the performance but disappointed we didn't take three points after leading 2-0," said Fenlon. "I can't be too critical of the players. For the first 35-40 minutes we were really excellent." Hibs were oozing with confidence throughout the first half and well worth their lead but Conor Pepper pulled one back before the interval and Richie Foran grabbed a late equaliser. "If we can perform to those levels, we will win more games than we lose," Fenlon told BBC Radio Scotland. "The players are bitterly disappointed, which is great because they feel they are capable of winning matches at this level now. "Inverness improved greatly in the second half. They are a team that never gives up. "We knew if we got ahead they wouldn't pack it in." Wotherspoon's goal was the pick of the bunch and Fenlon was pleased to see the midfielder enjoy an influential afternoon. Allowed space 25 yards from goal, the Scotland Under-21 international unleashed an unstoppable shot on the half-volley that found the top corner of the net. "I'm delighted for him," said the manager. "He's worked really hard pre-season. We had a good chat with him to get his confidence up. "He's a very good player. He just needed to believe in himself more. "Both wide players were good for us, Paul Cairney was excellent as well. I can't fault any of them." Fenlon was given a talking to by referee Euan Norris after voicing complaints about Pepper's goal. Alan Maybury hit the deck after being pressured by the midfielder on 38 minutes, but Norris waved play on as the Inverness player raced through and drove his shot in off the far post. "I thought Alan Maybury was fouled," explained Fenlon. "I'd like to see it again. "I just argued the case. I didn't abuse him (Norris) or anything. These things happen I suppose."